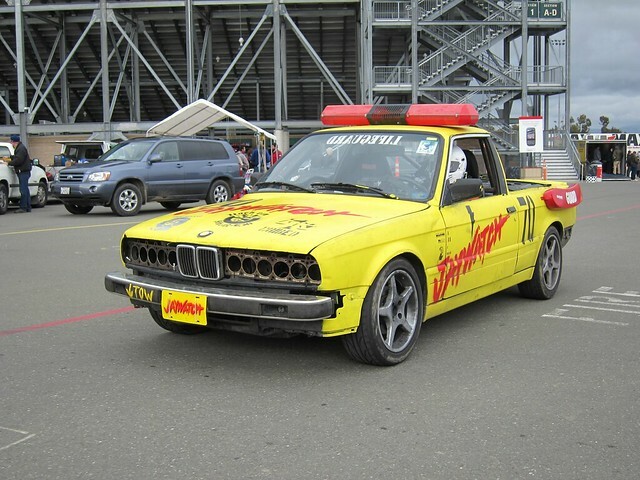 24 Hours of Lemons: Sears Pointless 2011! 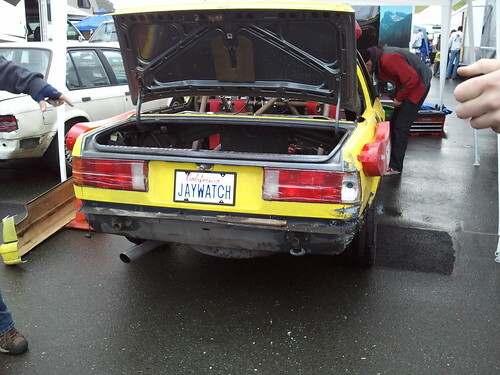 Sears Pointless 2011 is Team Jaywatch’s 4th Lemons race (2nd race with our current theme). Our car is a ’86 325es that had been underwater at some point. 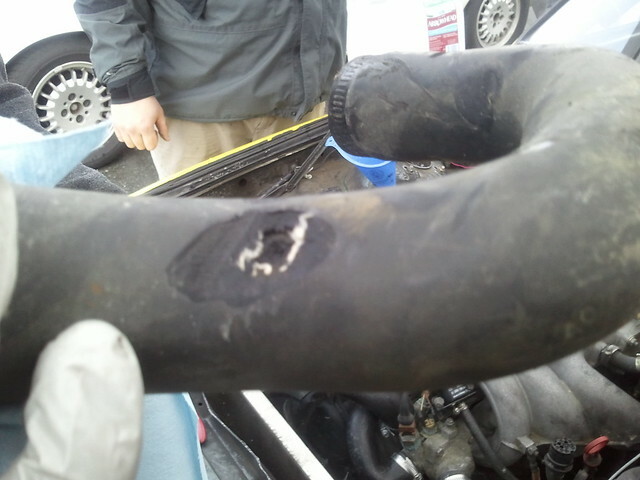 We started the race on our 2nd engine and ended on our 3rd. By far this was our craziest and most eventful race we’ve had. The past 3 we’ve been lucky enough to only lose a few master brake cylinders and a head gasket. Our eventful story starts Thursday night. Being only 1.5 hours from Infineon I make the rather dumb decision to leave at 7pm on Thursday to arrive at the track before it closes at 10. We start packing up around 5 and proceed to load our car (aka ‘Cheesy’, named after a receipt we found in her for a Cheesy Gordita Crunch from Taco Bell) at about 6:45. Little did I know that the trailer we rented from U-Haul was different than the previous one and our car now catches one of its bolts on the lip of the trailer. We tried backing Cheesy on, no dice, now catches on the frame of the car. It’s now about 7:15pm, raining and dark (rain and darkness will be a recurring theme for this story). Eventually one of us gets a great idea to back the trailer up to the driveway, which is about 4 inches higher than the road and drive Cheesy directly onto the trailer that way. Awesome! Cut to 20 minutes later and we still can’t back the trailer up correctly because our street is so narrow and trailers are complicated to drive in reverse! With time running out we unhook the trailer and all four of us pick it up by the hitch and push it in place. (That’s only about 500lbs/person to push). We then back the truck up to the trailer and hook it back on. Meanwhile we’re blocking a somewhat busy residential road, many cars have stopped, stared and turned around to find a way around us. Still raining. We finally load Cheesy onto the trailer, hook everything up and head out at about 8:15pm. 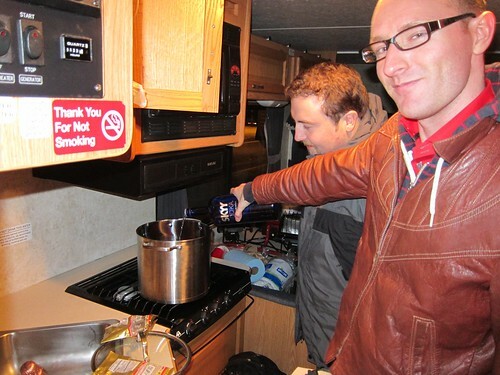 One 30′ RV, a truck and a trailer with Cheesy on board. Yay! We might just make it in time! Oh, we need gas. We stop at the wrong gas station that’s at the intersection we need to turn left at but can’t now, so we have to loop around about a half mile through residential roads and lose another 5-10 minutes. Oh well, now we’re on the highway and we might make it! Oh wait, rush hour on 880 is basically 6am-10pm, so we’re stuck in pretty slow traffic for about 45 minutes. By now it’s about 9pm or later, not much of a chance of making it to the track before it closes. Oh well. We get to Infineon at about 10:20, 2nd in line at the (closed) gates. 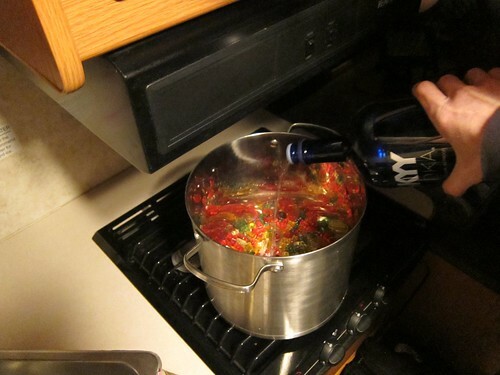 Since there’s not much to do now, we open some beers and proceed to make our vodka gummy bears! We get to bed at about 12 or 1 and wake up at 5:30am Friday to enter the paddock area and setup. Oh wait, how will we unload Cheesy? 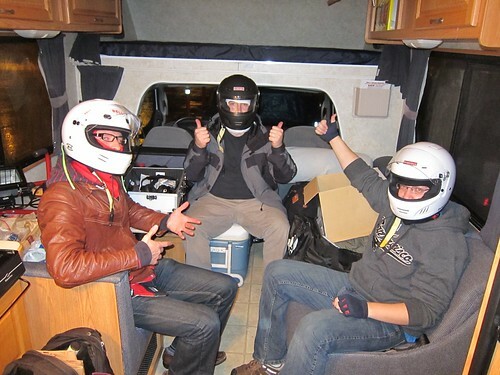 Fellow Lemons racers to the rescue! We back our trailer up to another team’s (empty) trailer with a less steep incline, back Cheesy onto it, move our trailer and drive Cheesy off. Success! We spend the next few hours setting up and by 9am when the track opens we’re ready to go. I’m first up and the track is WET. I’ve never driven on such a wet track. Cheesy has maybe 90hp on a good day and I’m able to break the rear loose at almost every turn with just a small amount of throttle. Scary as hell. Checkered flag comes down and I’m on my last lap before coming in. Coming through turn 8 I give it too much throttle and get myself facing backwards. Crap. I slide backwards through some grass and mud and hit the tire wall. At this point I’m thinking "Great, not a half hour into Friday and I’ve totaled the car. Good job dumbass." I attempt to move but I’m stuck, too much rain and mud. As I sit and wait I can see that the rear end doesn’t look too bad, and think maybe we can bang out the dents. A tow truck pulls me out a few minutes later and tells me I’m good to go! Not too bad, we pull the rest of the bumper off and call it good! Time for someone else to drive! Austin is up and heads out. Austin gets about 15 or 20 minutes of track time before he loses oil pressure and the engine dies on him. Crap. Cheesy gets towed back in and we start diagnosing. After checking various things (I’m the least knowledgeable team member, I have no idea what the real experts on the team did) Cheesy suddenly has oil pressure! Yay! We think the problem is electrical and decided to head to tech. 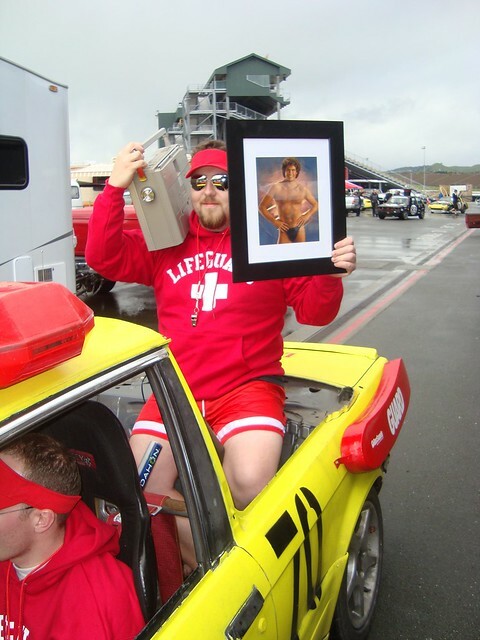 We get all dressed up and make our way to tech with a nice framed portrait of Hasselhoff for the judges and a boom box blasting "I’m always here". Sadly, we fail tech for a bad weld, missing exhaust hangers (although the car made it through tech at two other races with the same exhaust setup) and a loose air intake. Easily fixable. The judges love our theme and ‘gift’. After showing Judge Phil all our receipts and documentation he gets bored and lets us through with 0 penalty laps, yay! After attempting to fix our issues once we fail tech again. On our third try the inspectors are happy with our fixes and we’re good! Time to suit up again and hit the track. 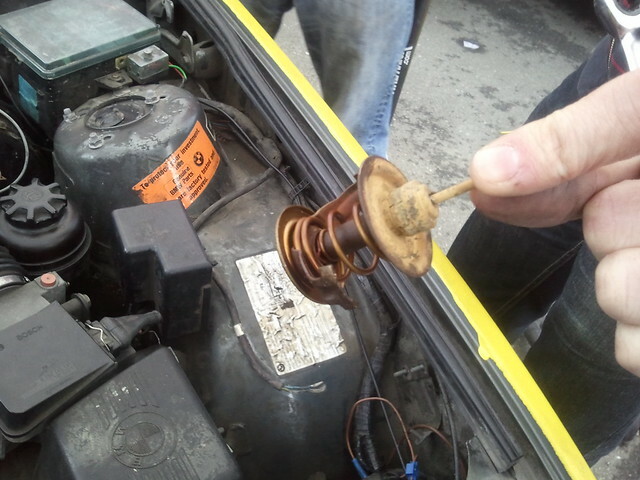 So we drove Cheesy hard and fast with just about no coolant flowing around the engine. Sometime during this diagnosing we turn the engine over with a spark plug removed and it sprays water about 10 feet. Really not good. So the engine is toast and we have no spare. Gayest E30 Ever! team to the rescue! They happen to have a spare engine that works and are willing to sell it to us. The only condition is if their engine blows we have to pull the engine from one of our driver’s 325e that he drove to the track. Deal! 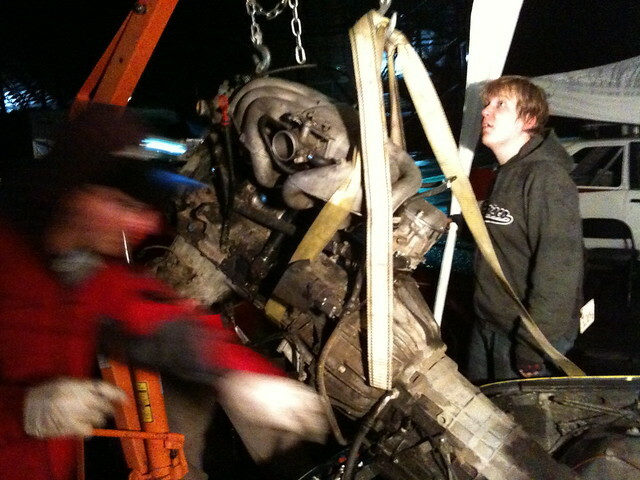 At about 6 or 7pm we begin the engine swap. In the rain and wind. At around midnight (I think) we manage to yank the engine and transmission and proceed to disconnect the two. We’re slightly stymied by BMW’s amazing method of connecting the engine to the torque converter via 3 VERY difficult to reach bolts and many other bolts around the housing. Once we disconnect the two we attempt to mate the ‘new’ engine to the old transmission (oh, did I mention it’s an automatic?). Now that we’re pretty damn tired we can’t figure out how connect the torque converter to the transmission. No matter which rotation we put it in on it doesn’t go all the way in. At about 4am we realize we’re not getting anywhere and decide to get a few hours sleep. We wake up at 8am Saturday, optimistic that we’ll be ready for the race (HA!). Another hour of fussing with the torque converter and we get it connected to the transmission. We spend the rest of the day getting the engine back in, hooking everything up, etc, etc. At about 5:15pm we’re ready to go! Just enough time for a few laps! Marshal suits up and heads out. Yay! We’re finally racing! Although the engine is running REALLY rough. After the checkered flag we attempt to start Cheesy and she won’t run for more than a few seconds. Crap. At this point I’m feeling burned out and know that I really can’t offer much expertise. So I decided it’s time to dispense our vodka gummy bears and skittles vodka! After chatting with him for a few minutes I complain it’s hard to carry 5 bottles of liquor and a pot full of vodka gummy bears. 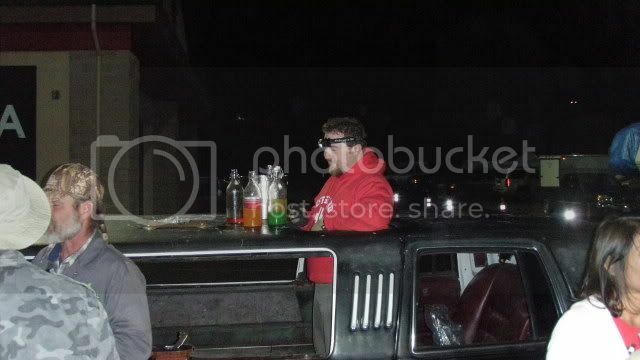 Chris’ response is "Why don’t you use my limo?". Hell yeah! After we run out of gummy bears we head back to our paddock. Dmitriy, our E30 genius, figured out that one of our sensors was connected to a wrong connector and that’s why Cheesy wouldn’t start, hurray! At this point we don’t have much to do, which feels weird compared to the previous night. We spend some time cleaning up and head to bed at midnight for our first solid night’s sleep in two days. We wake up Sunday morning at about 7 and prep. 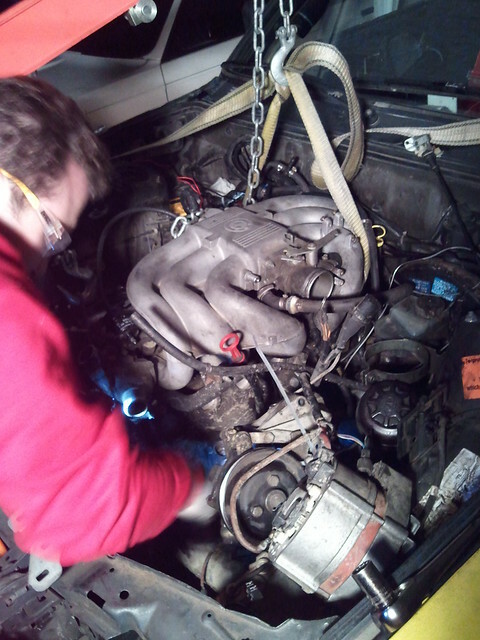 Dmitriy is up first and says the engine is running a little rough, but at this point we say "Screw it, just drive.". The rest of Sunday is rather uneventful (thankfully!). Marshall locks up the wheels going into turn 9 and goes four wheels off, but the judges are lenient and let us off with just a verbal warning. I get a great hour of driving in, Cheesy isn’t fast, but she can brake much later and take corners faster than most cars, so it’s a lot fun to pass people that way. Towards the end of the day one cylinder stops firing, but that’s a minor issue, the engine still works and we manage to finish! All in all, one hell of a race! Looking forward to our next one at Arse-Sweat in August!